St. Maarten, Netherlands Antiles in the Caribbean. While winning is the main thing, you won't have to wait on 'lady luck' to have a fantastic time at the Casino Royale. From the time you pass through our chic and luxurious entrance you've already won yourself a great experience. 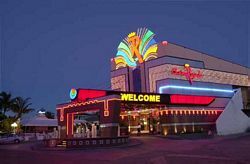 Name your game and we've got it somewhere on our extensively remodeled casino floor and don't miss our many giveaways. A live band is in attendance and who knows what's in store as the night rolls on. Take it up a notch to the elegance of The Point Restaurant, bordered by our tropical gardens and overlooking the Caribbean Sea. This natural theme is reflected in our a la carte menu of seafood and steak featuring recipes from the various Caribbean Islands. Tableside service complements the relaxed sophistication of The Point, while an extensive wine list offers aficionados with many choices to savor. Seating for 120. Also available for group and special functions with an outside bar. Open on selected evenings for dinner only. The Palms Grill is situated beachside and provides direct access from our gardens or the shore. A casual, open-air setting is perfect for our � la carte menu with choices ranging from club sandwiches to full meals with special selections for the kids. Choices include barbecue, grilled favorites and creative salad selections as well as continental and pastry specialties. Seating for 130. Open daily for breakfast, lunch and dinner. Breakfast at selected times of the year. A few steps away, you'll enter the world of the Ocean Terrace Restaurant, full of bountiful dining options every day of the week. Mediterranean decor provides you with fun, market-style food stations serving the dish of your choice. Freshly-baked goods, tropical fruit, hot dining options and an omelet station highlight breakfast each morning. Theme nights feature different cuisines and cultures while terrace dining with a view of the Caribbean Sea adds to the laid-back ambiance. Seating for 250. Open daily for breakfast, lunch and dinner. Pizzeria Napoli serves fresh Italian Pizza every day (except Sunday) for lunch. Dinner on selected evenings. Our coffee bar serves freshly brewed coffee and coffee cocktails including pastries and sandwiches for a snack in between. Open daily from 8 a.m. to 4 p.m. Located in the Sky Tower Lobby, the Latitude Bar offers subtle sophistication in a casual, relaxed setting. Featuring a full bar with tantalizing cocktail selections, there is also a large screen television for watching the big games. Computers with Internet access are located here for your use. The lively Maho Promenade offers a delightful collection of dining choices, including the world renowned Cheri's Cafe, Soprano's Piano Bar and many others. A total of 40 upscale duty-free boutiques and shops line our new promenade and stock an extensive selection of the world's finest jewelry, watches, apparel and souvenir items. Most of our shops stay open until 11 p.m. for your shopping convenience - much later than in the commercial centers of Philipsburg and Marigot. You'll also enjoy the live 'Street Carnival' featuring the Casino Royale Dancers with their high-energy, sassy stepping Caribbean moves. A lot to keep you as busy and entertained as you like! The Oasis Bar is a must for guests ready to plunge into the St. Maarten vibe. The inviting swim-up bar lies within the massive Oasis Pool. Tantalizing concoctions with local twists give way to hours of poolside sunbathing, swimming refreshment and a view of the Maho crowd. No need to be shy! The come-as-you-are attitude welcomes you to sit back with a book, or to strike up a conversation with your neighbor. And the bar staff is as friendly as they come. With 534 rooms that combine casual elegance with upscale sophistication, the resort is a 'destination within a destination'.